H5N1 influenza virus--does it live up to the hype? Now, I’m a big fan of Laurie Garrett, and I obviously have no idea of knowing if this is all the said on the H5N1 mortality rate or if she elaborated further, but it’s quotes like this that lead people to stress more than they should about the H5N1 situation. A new paper just out in the Journal of Infectious Diseases (summary here) demonstrates one reason why the public shouldn’t start freaking out just yet. The problem with the figure Garrett cites is that it kills ~55% of the cases we know about. This is a classic case of sample bias. Those who are most sick (and thus, most likely to die) are also most likely to go to a hospital or clinic to be examined–and therefore, are also the most likely to have a clinically-confirmed case of influenza due to the H5N1 strain. Hence, the mortality data we have for H5N1 only comes from this sickest segment of the population–artificially raising the mortality rate. 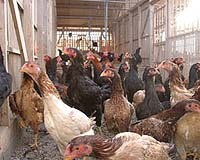 Puzelli et al.’s study, then, is timely due to the fact that it shows that sub-clinical infection with avian-type influenza viruses does occur (in almost 4% of their cohort of poultry workers). For someone versed in influenza evolution and epidemiology, this is both disturbing and unsurprising. First, a bit of background on influenza virus. The virus has an RNA genome, which is segmented into 8 parts. These parts can re-combine and make a novel virus, containing a few segments of each of the parent viruses. In some cases, this progeny virus may be better adapted for a new host than one (or both) of the parent viruses. An example. Say a human currently is infected with a (human) influenza virus. Let’s say it’s one of these folks in the Italian cohort of poultry workers. Maybe he’s not sick yet, so he goes into work, where he’s exposed to one or more types of avian influenza virus. If he becomes co-infected, the two types of virus can mix, possibly producing a “humanized” avian influenza virus, which may be transmissible between humans while the parent avian virus was not. This is the stuff of pandemics, and the kind of thing that keeps influenza researchers awake at night. And this isn’t far-fetched. Other groups (such as Chris Olsen’s lab) have shown that workers in close contact with swine can show serological evidence of prior infection with swine influenza viruses, even though the clinical influenza infection is rarely documented (that is, it’s either subclinical infection, or mild enough so that the patient doesn’t see a medical professional). Therefore, these epidemics may very well be percolating as a series of mild infections, allowing the virus to become more adapted to humans (and hence, possibly more transmissible *between* humans), while the attention is focused on those rare severe or fatal cases. This again shows why we need good surveillance for not only influenza, but a number of different infectious diseases. We focus on the acute diseases, but it’s difficult to say how many other pathogens are out there, infecting us, and possibly triggering other types of disease down the road. ETA: the new issue of Emerging Infectious Diseases has an article on the evolution of Asian H5N1 viruses, here. Of the ones they examined, they don’t see any reassortment with human viruses yet. Additionally, neuraminidase inhibitors work against the isolates they tested.